Ya know how sometimes you are just going about things, minding your own business, yet you can't shake the feeling that you are being watched? Well, that exact thing happened to me the other day. I was feeding Tag and Maggie May in their pens, which are in the barn, and I continued to get that feeling that I was being watched. I'd stop every now and then and look around, but I didn't see anyone. So, I'd continue with what I was doing. Something flew past me and almost hit me in the head! Apparently, my dogs aren't the only critters taking up residence in the barn. I thought about asking for their rfid credit card to charge them rent, but that one on the left kept giving me this pitiful "I NEED foooooood" look. So, they can stay free of charge... but NO wild, late night parties!!! Barn Swallows, are such beautiful little birds.My Sister has a pair nesting in her garage every year. Aren't they adorable? You WERE being watched! And I must get the card reader for my husband's camera because he got my Camera Critters pictures for me, just in time! See you with them tomorrow. Great narrative. These birds are so pretty. They look cuddly, but I'll bet they wouldn't stand for a pet. Swallows... oh my... when I was about six or seven my mom would send me on an errand to get the mail when my other sister was a baby. I used to walk down the street to the post office. When I reached the porch I would be dive bombed by swallows and they would squawk at me while flitting at my hair. It scared me to death. lol. Now I stay a healthy distance from them. Just so long as they don't expect YOU to give them their food! How fabulous to have such unexpected tennants. They are beautiful birds and your post makes me recall similar situations when I was growing up on the farm. 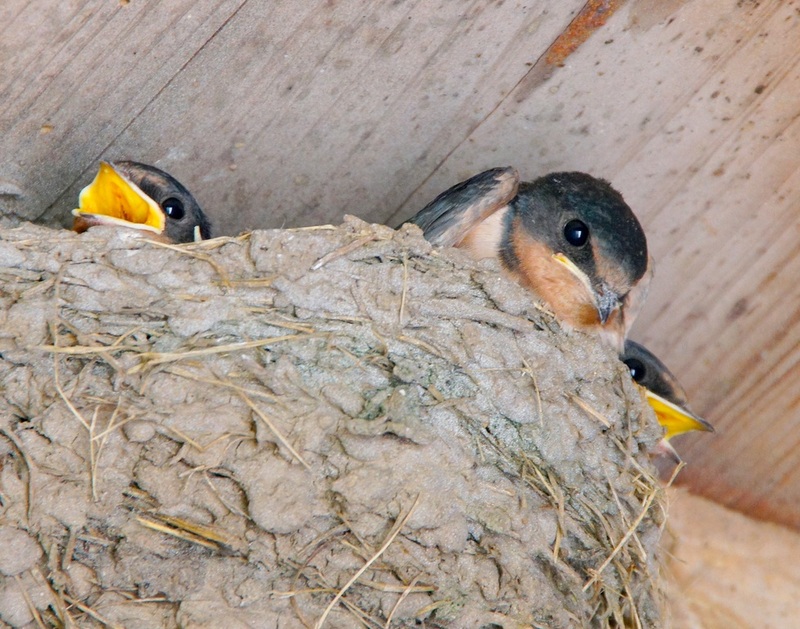 What a sweet photo of the barn swallows. Enjoy your day! you got some barnswallow chicks. :) I love them. Cool capture! I like the one with the hungry look and an open beak(? had to use a dictionary..) So intensive yellow. Cute capture of the Barn Swallows. The young one is adorable. Great post and photo. Have a great weekend! We've got a similar situation here! A bit loud when they're hungry, aren't they? What a nice surprise! Nice photos. oh my, look at that sweet little mouth!! Cute little critters...hehehe. The one looks hungry! Ha, ha, ha... You have cute watchers.